Stephens, who returned to competition at Wimbledon after nearly a year off because of a foot injury, recovered from a second-set meltdown to end ninth seed Williams's hopes of reaching a third major final this year. "I have no words to describe what I'm feeling what it took to get here. The journey I took. I have no words," said Stephens, who underwent foot surgery last February. "If someone told me I'd make two semis and a grand slam final this year I would have passed out, which is what I feel like doing now. "I don't know how I got here. Hard work, that's it." "I'm honestly just honoured to play at the same time as her. One of the greatest to ever play our game. She's one of the greatest competitors and I'm honoured to share the court with her and glad to play at the same time as her. "For American tennis there's no question marks. The proof is in the pudding. American tennis, here we are." She saved two break points in the following game but Williams levelled for 2-2 when Stephens's forehand sailed wide. 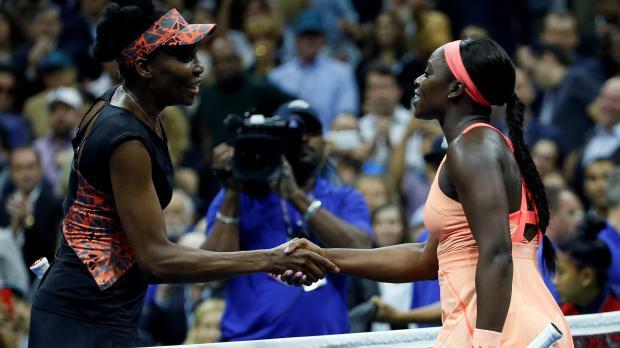 "It was definitely a contrast of play," Williams said of the roller-coaster match. "You know, I continued to play aggressive and continued to play the kind of match that it takes to win. Just made too many errors there at the end." Sloane Stephens shakes hands after winning her match against Venus Williams.